Finding a reliable resource that surveys the religious landscape of this contemporary world is a daunting task. Not because there is a lack of resources, but because there is a lack of good resources. In fact, the options for such resources are almost beyond count, but the content therein is often mediocre at best. This is true across the board for all faith systems who actively seek to engage other religious worldviews. However, with the release of Handbook of Religion: A Christian Engagement with Traditions, Teachings, and Practices (Baker Academic, 2014), the once difficult task of sifting through growing mountains of possibilities for useful information has become a whole lot easier for the Christian. Handbook of Religion is a comprehensive compendium of Christian engagement with the various manifestations of religious belief around the world. This type of book is nothing new to the market, but the judicious execution and intentionality interaction of this resource are unique beyond anything else currently available. 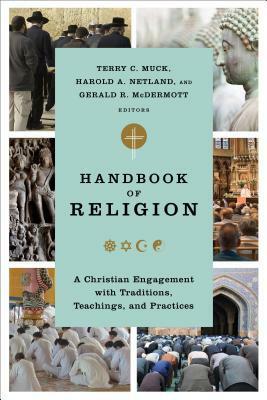 Handbook of Religion opens with a strong introduction to properly orient and familiarize the reader with the Christian engagement of other religions. The book is then divided into four subsequent sections: (1) World Religions, (2) Indigenous Religions, (3) New Religious Movements, and (4) Essays. First, the “World Religions” section seeks to interact with some of the major world religions from a Christian perspective (i.e. Hinduism, Buddhism, Judaism, and Islam). Each major world religion is discussed in detail, including interaction with the history, beliefs, and practices of the religious system. Moreover, specific chapters on each major religion are dedicated to Christian contact, theological exchanges, current issues, and adherent essays. Second, the “Indigenous Religions” section seeks to interact with some of the native religions around the world. This section follows the same format as the prior, but the religions are discussed geographically as opposed to with specified titles (i.e. India, China, Europe, Africa, Oceania, etc.). Third, the “New Religious Movements” (NRM) section seeks to interact with some of the more recent religious phenomenon around the world (i.e. Mormons, Jehovah Witnesses, Satanism, Atheism, etc.). This section, like the prior two sections, follows the same chapter format of discussion. Lastly, the “Essays” section provides a number of useful essays concerned with religious engagement with broader social issues (i.e. science, gender, violence, human rights, environment, etc.). Handbook of Religion is prosperous in the execution of the intended goal for several reasons. First, the breadth of interaction in this resources reaches every corner of the earth—literally. It is easy to find resources that engage the major world religions from a Christian perspective, but rarely will the reader encounter a comprehensive look into the indigenous religions. This will better prepare the sensitive reader to serve in these areas. Second, the vast diversity of contributors to this volume is incredibly valuable for the reader. A total of fifty-five of the top religion scholars in the world, representing a broad spectrum of Christianity and other religious faith systems, contributed to this volume under the editorial guidance of Terry C. Muck, Harold A. Netland, and Gerald R. McDermott. Third, the inclusion of an “Adherent Essay” brings balance and insight where balance and insight is needed. Fourth, each essay concludes with a brief bibliography. This will help the curious reader investigate deeper as interest arises. Fifth, the generous number of “Study Aid” sections throughout the volume bring the reader in contact with helpful charts, maps, timelines, and sidebar discussions. I personally found the timelines to be extremely helpful when examining the history of the religions, and I think the reader will as well. Lastly, the layout of the volume is extremely user-friendly. This may not seem like a big deal for most, but the content on a page is only as good as it is able to be consumed by the reader. If the content is a burden to consume it is nearly useless. This volume delivers solid and digestible content in an inviting and engaging environment—a combination not often seen, and rarely executed well. Handbook of Religion: A Christian Engagement with Traditions, Teachings, and Practices may appear as just another mediocre world religion textbook from a Christian perspective, but don’t let your presumptions lead you astray. This volume is comprehensive in scope and judicious in examination. Muck, Netland, and McDermott have assembled an appropriate team for the task of this resource and the reader will benefit greatly from having it on their bookshelf. Normally a review on a book of this caliber would conclude with a recommendation to pastors, teachers, and students, but this would be highly misdirected. If you are a Christian living in this world and engaging those around you, this book should be in arms reach of your nightly reading chair and consulted often.